Everyone loves a good story. It can inspire. It can entertain. It can make you laugh. It can make you cry. But did you know that stories can also help align your marketing and sales efforts? Whether you’re a SaaS startup or have been in business for some time, but are struggling with your inbound marketing goals, you’ll learn how storytelling can help with your marketing and sales efforts. What are the benefits of using stories in your marketing strategy? Glad you asked. There are many other startups and more established businesses with a product or service similar yours. Simply focusing on the perks and benefits of what your product or service can give your target customers won’t be enough to convince them. You need to give them something more compelling enough for them to sit up and take notice. A well-crafted story does that. Instead of only talking about what you have to offer, it goes right straight into the heart of your business. It tells your target market the why behind your business: your purpose, your cause, your vision, and your beliefs. According to a recent report published by Hubspot, 63% of marketers consider generating traffic and leads as their biggest challenge. In a talk he gave at TED, Simon Sinek points out: “People don’t buy what you do. They buy why you do it.” That’s because all decision-making processes are done in our brain’s limbic region, including the decision purchase a product or opt-in for a service online. This is the same part of the brain that is responsible for our feelings and behavior. That’s why stories are incredibly powerful tools in marketing. A well-crafted story that begins with the “why” about your business allows you to communicate with your target audience from the inside out, touching their emotions and feelings. When that happens, you’re talking directly to that part of the brain that is responsible for decision-making, driving your audience to take action instead of being a mere spectator. 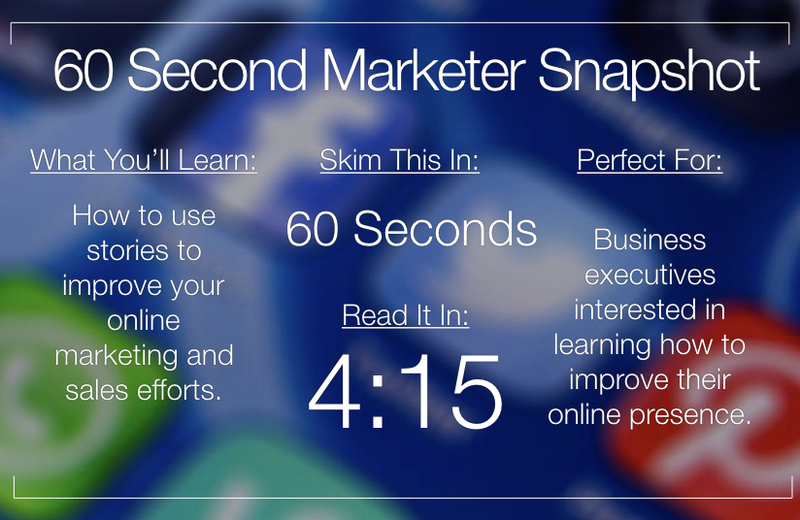 Digital marketing is cost-effective, quick and far-reaching. But for your target audience, it can feel cold and distant. Storytelling brings in that human element that your audience longs for, slowly lowering down the walls brought up by initial skepticism and making them more open to what you have to say. Now you know why you should incorporate storytelling into your inbound marketing strategy, the next question is how to do it. It all starts with creating a story for your buyer persona. If you’ve done any form of online marketing, you probably know what a buyer persona is. In fact, creating a buyer persona is the first thing to do when you create any kind of marketing strategy, whether it’s a campaign on Facebook or a downloadable offer on your website. The key to creating an effective buyer persona is to make it as detailed as possible. In fact, 71% of companies who meet, or even exceed, their revenue and lead goals are those that have a well-documented buyer persona. There are several ways on how to create an effective buyer persona. One is that you can use a free buyer persona creator tool. Hubspot’s MakeMyPersona tool is a good example. Another way is to create a story behind your buyer persona. Anthropologie is one company that does this extremely well. 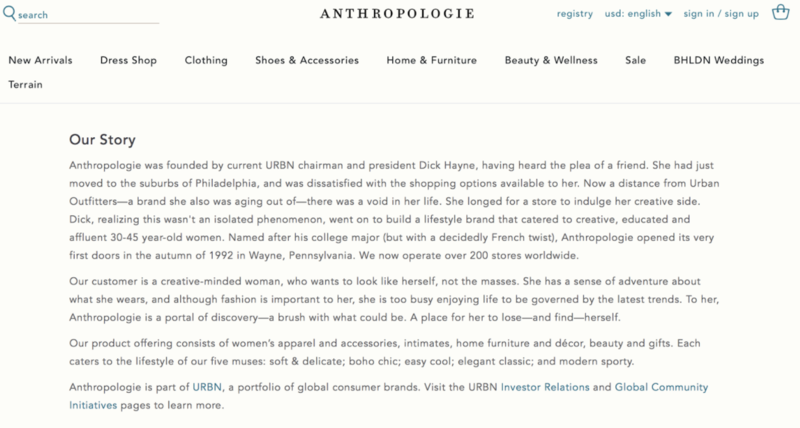 Instead of describing the demographics of their buyer persona, Anthropologie crafted their buyer persona not as a customer, but as a friend that reached out to them for help. It’s from here that they then developed the story behind their brand. Creating a story for your buyer persona doesn’t only make this task more enjoyable, but it makes your buyer persona more alive and real for you and the rest of your team. He or she is no longer someone that you just communicate with on a business level. Rather, you can take it down to a more personal level so much that your buyer persona no longer sees you as just another startup after their business, but someone who genuinely wants to help. What are your client’s fondest childhood memories? What does your customer do for a living? The more in-depth you can go, the better. Now, you may be wondering, will a detailed buyer persona like this turn off some people? To be very honest, it will. But in the right way. By developing a story for both your buyer persona and your brand, you’re essentially filtering out those that visit your website through your brand storytelling. Those that see themselves in the stories you share as part of your inbound marketing strategy, and someone that seems to understand them to stay. These are the ones that now are ready to listen to learn more about what you have to offer, and eventually decide if they would do business with you. As you can see, using stories in your inbound marketing strategy beyond keeping things entertaining for your audience. When done right, a well-crafted story will help you reach out to your audience at a personal level to help your startup build a relationship and, eventually, convert them into a loyal customer. About the Author: Kevin Payne is an inbound marketing consultant that has helped multiple SaaS startups increase their online sales through the use of inbound marketing, growth hacking, and social selling. When he’s not advising startups he often writes about the many lessons he has learned from the trenches.